Four UC College of Medicine graduate students, Marissa Smail, Camille Sullivan, Chrystelle Vilfranc and Paige Balencia Greenwood, all shown above, have been named fellows with the Yale Ciencia Academy for Career Development. The academy has accepted 40 young researchers from across the United States to provide opportunities for professional mentorship, networking and other skills designed to make a contribution to their communities through science outreach. Yale Ciencia Academy’s focus is to increase the number of scientists from underrepresented or underserved communities. The academy is sponsored by the non-profit organization Ciencia Puerto Rico in collaboration with Yale University. As part of their year-long fellowship Greenwood, Smail, Sullivan and Vilfranc attended the American Association for the Advancement of Science (AAAS) meeting in Washington, D.C, Feb. 14-18, an important part of the academy’s networking program. That meeting was an opportunity to meet influential figures in science, government and politics. The graduate students will remain engaged with the Yale Ciencia Academy’s program throughout 2019, mostly via webinar, to stay connected with, and learn from, leaders in the biological, biomedical, health and behavioral sciences. Paige Balencia Greenwood is a third-year PhD candidate in the Neuroscience Graduate Program in the College of Medicine. She graduated from Hampton University with a bachelor’s in biology and was awarded the Albert C. Yates fellowship after her acceptance to the University of Cincinnati. Greenwood is a firm believer in community outreach and has been the co-chair for Brain Awareness Week, which aimed to educate the community about brain research. She has also led a workshop for the Green Light for Girls Conference on Neuroscience in 2018. Greenwood is currently working on her dissertation under the direction of Tzipi Horowiz-Kraus, PhD, assistant professor of pediatrics at UC and program director of the Reading and Literacy Discovery Center at Cincinnati Children’s. She is studying the role of socioeconomic status (SES) on brain structure and function in relation to reading acquisition in typical and atypical readers. Her long term goal is to use her research to contribute to bridging the gap in academic disparities in low income neighborhoods. Greenwood recently published a first author paper in the scholarly journal Brain and Cognition on the association between maternal reading ability and the functional connectivity of regions within the brain related to language and executive functions in four-year-old girls. Marissa Smail is a second-year PhD student in the Neuroscience Graduate Program in the College of Medicine. She is an honors graduate of St. Vincent College and the first in her family to attend college. Her current research investigates the molecular mechanisms underlying depression-like behaviors in a novel rodent model of loss, utilizing integrated bioinformatics analyses of RNAseq, proteomics, and kinomics data from multiple emotional regulatory brain regions. This project is highly collaborative, bridging departments and universities, and seeks to identify novel targets in depression research. Smail also participates in organizing Brain Awareness Week and other outreach events, which focus on bringing neuroscience to schools and the general community. She is passionate about a big-picture approach to research which uses innovative techniques, platforms and collaborations to deepen our understanding of complex neuroscience questions. Her long-term goal is to become a principal investigator and conduct such big-picture research, with the ultimate goal of improving therapies for poorly understood neuropsychiatric disorders. Smail is a researcher in the laboratory of James Herman, PhD, chair of the Department of Pharmacology and Systems Physiology. 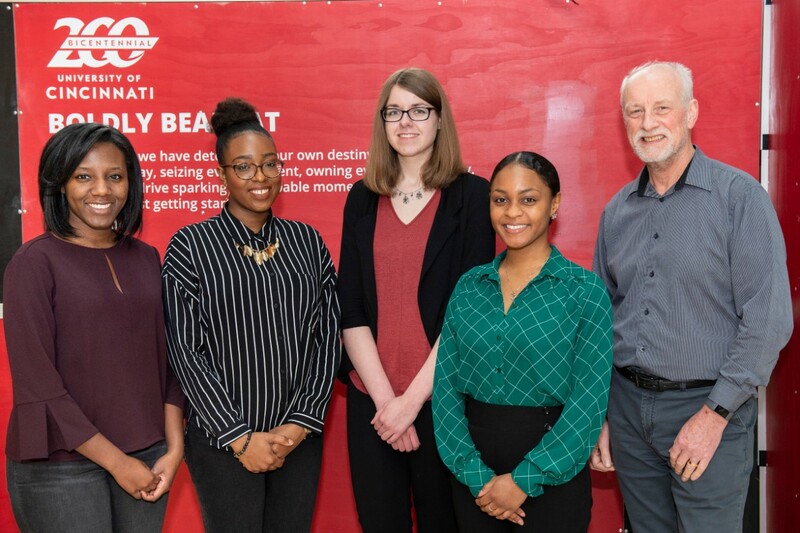 Camille Sullivan, Chrystelle Vilfranc, Marissa Smail and Paige Balencia Greenwood are shown with Iain Cartwright, PhD, in the UC College of Medicine. Camille Sullivan is a fifth-year MD/PhD student in the College of Medicine pursuing graduate work in the Department of Cancer Biology. A graduate of Massachusetts Institute of Technology, Sullivan accrued an extensive background in cancer research during her undergraduate years including a Continuing Umbrella of Research Experiences (CURE) fellowship at the City of Hope Comprehensive Cancer Center and an externship at the National Cancer Institute. At UC, Sullivan studies in the laboratory of Susan Waltz, PhD, professor of cancer biology. Sullivan’s focus is on the mechanistic roles of the Ron receptor tyrosine kinase in the prostate tumor microenvironment with a focus on the antitumor immune response. She was recently awarded the highly competitive National Institutes of Health (NIH) F31-Diversity Predoctoral Fellowship from the National Cancer Institute to support her thesis research. She plans to pursue orthopaedic surgery with the long-term career goal of becoming a surgeon-scientist, bridging her research and clinical practice to address key areas of clinical need. Chrystelle Vilfranc is a fifth-year PhD candidate in the Cancer and Cell Biology program in the College of Medicine. She graduated from Oakwood University and completed the Alabama Agricultural and Mechanical University Ronald E. McNair Scholars Program. Chrystelle participated in an NIH Post-Baccalaureate Research Education Program (PREP) at the University of Alabama at Birmingham where she assisted in modeling a cure for Cooley’s Anemia in stem cells of a humanized rodent model. Her dissertation research involves elucidating the role of efficient DNA damage and response signaling in the protection against chronic liver disease including hepatocellular carcinoma, the most common form of primary liver cancer. Additionally, Chrystelle is interested in science communication, science outreach, and overall health and cancer education. Her long-term goals include increasing health education and scientific outreach opportunities in communities of color as well as creating initiatives to diversify and retain students of color in STEM from the kindergarten level to the PhD. Chrystelle currently serves as the digital curator for VanguardSTEM, a virtual community for women and non-binary persons of color in the fields of science, technology, engineering and medicine. As an advocate for mental health and well-being, especially among persons of color, she began a writing series with VanguardSTEM entitled #RevealToHeal: A Mental Health Series for Women of Color in STEM. Iain Cartwright, PhD, associate dean and director of the Office of Graduate Education in the College of Medicine, says the four fellows offer excellent representation for the university and will make a wonderful contribution to the Yale Ciencia Academy for Career Development.